I have done a lot of cooking over my lifetime. 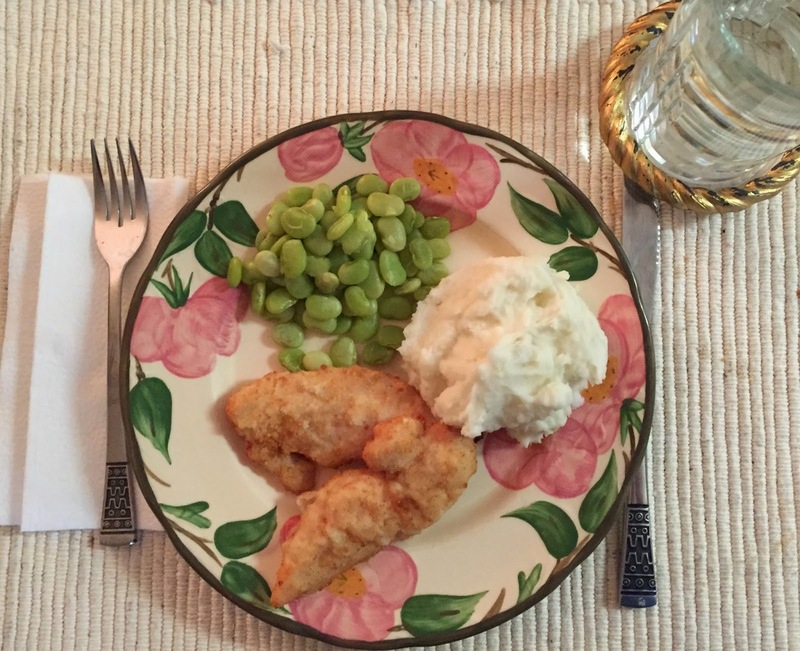 When your children are growing up there is an expectation of always having home cooked meals. At least there was in my household, and I loved making sure that my children were well fed. I don't know about you, but as I have aged and only have myself to cook for my interest and energy for cooking has waned. However, I do want to eat as healthy as I can on my budget, which means no fast foods for me. I have noticed that by the time nighttime rolls around I just can't seem to muster up the energy to go in the kitchen and turn on that stove. So I have gotten in the habit of cooking my main meal in the middle of the day. I keep it simple. I use organic ingredients as much as possible and eat gluten free. I also set a place for myself at the dining room table and take the time to relax while I am eating. Today's lunch consisted of organic gluten free chicken strips, a large organic potato, which I mashed and divided in half so there would be leftovers tomorrow, and organic baby lima beans. I buy a large bag of frozen lima beans at Fresh Market. I scoop out a third of a cup each time I cook them and the bag lasts a really long time. Very economical for one person. I don't eat desserts, so I don't have to worry about those. I always make sure to have plenty of fruits and vegetables. I start each day off with green juice. 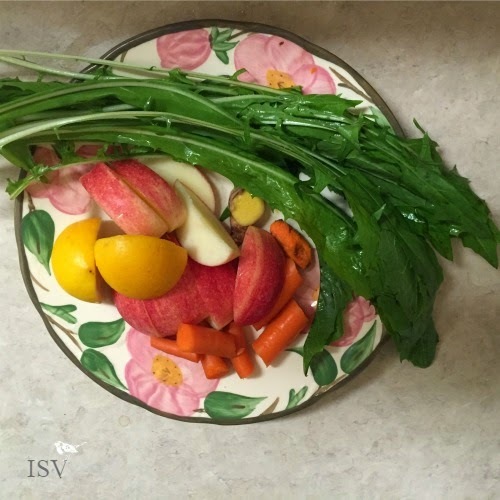 I change up my juice recipe according to what I have on hand, but my basics are dandelion greens, organic apple, organic lemon, turmeric root, ginger root, and organic celery. It's a great way to start the day off feeling healthy. I always seem to have a slump in the middle of the afternoon, so I eat a banana with a tablespoon of organic peanut butter. YUM!!! My nighttime meal is always a light one. I don't like to eat much at that time of day and I am usually not hungry then. As I said, I like to keep it all simple. There are a lot of cooking for two ideas on the internet and those meals can be divided into two meals for leftovers. Don't stop cooking for yourself just because you are living alone. You deserve nice healthy meals. 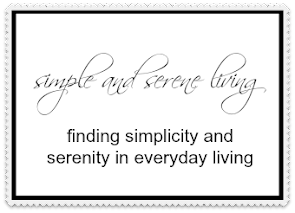 It's a big part of living a simple serene lifestyle. I really need to get better about cooking for myself. I also find I'm not ready to cook in the evening. I should start making a noon meal with leftovers a few times a week. It is really so much easier for me to cook at noon, Linda. I find I am eating healthier by doing that. I'm cooking for two these days, but when my husband is out of town I find it very difficult to cook properly for myself. It would be a habit to develop. Your idea of cooking a main meal at midday is great and I admire that you set a proper table for yourself. I actually find that I eat less when I sit at the table and focus on the meal. It's nice to be home at noon to fix my main meal then. I find it hard cooking for one. I try to cook larger things on the weekend (slow cooker stuff etc). I leave a couple portions out for weekday lunch and freeze the rest in individual servings. That's a great idea, Kim. I really do need to drag my slow cooker out and start using it again. I used to cook for myself when I lived alone until I married at age 40...I would cook large amounts on the weekend and have it during the week. Now we also are organic and GF. It has been an adjustment for my husband but a good one. I also try to have a larger meal at mid-day. We cook a lot of soups that I make fresh. Easy to reheat and they can be buy themselves or with a fresh salad. I am still trying to eat slower and get used to eating at a table as I worked as an educator for over 30 yrs and was always eating on the run. I was interested to see turmeric root listed in your juice ingredients. I've just been reading on the health benefits of turmeric. I also sometimes grab a tablespoonful of peanut butter for a mid-day snack. When I was single I read somewhere that you shouldn't deprive yourself of having a lovely meal. Food is so important to me that I made myself a good meal each night. And now that I am married, I still cook healthy, and we love to eat a variety of interesting meals..
Laura what a great idea to do the main meal at lunch, it's much healthier then a heavy meal at night. You make the most attractive lunch, and such have a beautifully arranged table that you are sure to inspire. Was that a pink grapefruit, or watermelon? During the week we can't eat before 6:30, but on the weekends we often eat our large meal around 4. We've been shopping at Fresh Market here in Cary, next I would like to check out Whole Foods. I love the flowers and coffee at Fresh Market! When eating alone, I rarely eat at the table. You eat a lot like I do, Laura! I'm very health-conscious and eat "clean". I buy everything organic when possible. I also eat mostly vegetarian. I don't have any issues with gluten, so I don't avoid that, though it's always whole grains. No fast food for me either. I have a veggie and fruit smoothie almost every day too, and a banana with almond butter is one of my favorite snacks or small meal!